If you are an owner or manager of a restaurant, bar, commercial facility, hospital or local cafeteria; your business may be doing well, but it is highly likely you would like to make more money right! One of the easiest ways to do this is by up selling, or convincing customers to upgrade their current purchase and purchase additional food items or dessert. How can you use up selling techniques in your bar or restaurant? Main Auction Services encourages you to make sure you offer the best and most current fresh ingredients available to you for all your foodservice options in the kitchen. If all the food ordered is fresh, you will never have a complaint about the quality. Secondarily, preparing flavorful meals and desserts is by far the best option for going one more step further and offering new items to consider. Once the menu is decided, up selling into this menu is critical across the board. But how it needs to be done is the most critical for it's success. Let's talk techniques to consider. Train your servers - Make sure every server understands how important up selling is and train them how to do it. Before each service, routinely go over new information with them and make sure they know how upselling can help your restaurant. Determine which items to up sell everyday - Be sure your servers know which items they should focus on. You might have a new dessert menu that you want to push, or you might want to focus on selling pricier drinks. A wonderful food item may have been purchased for the manager special or even a new beverage can be an option. Determine what times to up sell - You may want to entertain the idea that certain items should be mentioned at certain times. The servers could mention your appetizers before customers order their entrees, or even new drink items for special occassions like Fathers Day or even Mardi Gras. Try to be helpful - The idea is not to force new items on your dining patrons. Your regular customers may have their favorites, so an upsell about a dessert or bread item new to the menu are options. 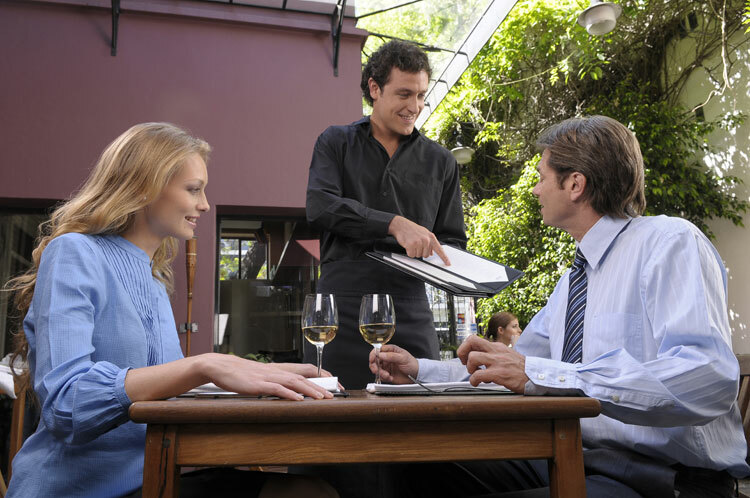 Your server is there to help them make their dining experience even better! Servers and staff must be knowledgeable - If you want to be able to upsell, you have to know the menu. Each server should know exactly what’s on your menu and be able to suggest what drinks, sides, etc. go with each entree. Maybe some sides are another idea. Make sure the server can make it sound irresistible - It is true that a large part of up selling is convincing. Make whatever you’re up selling sound attractive or yummy and your customers will be far more likely to order it! Remember to include takeout options - Takeout options can be a great way to up sell. Maybe your customers are too full to eat dessert right now, but they can order it and bring it home for later. Make your first up sell option be what the customer orders - Not every offer will work on every customer. Treat each customer like an individual and focus on his/her specific needs and wants. This is not a sales pitch so don't make it sound like one - Customers came to your restaurant to have a nice time with their friends and family, not to get a sales pitch! Try to sound natural and conversational. Make sure the options are very specific - Would you care for some dessert this evening, we have some delicious cheesecake would be a great end to your meal,” is a lot more enticing. You can always focus on hesitant customers - If customers don’t seem sure about what they’re going to order, you’re more likely to be able to upsell by making a recommendation. Are they taking a long time to look at the menu or asking a lot of questions? These are good customers to focus on. Ask about a larger size - Gently encourage to your customers they have the choice between ordering an 8 ounce or a 12 ounce steak. When they’re ordering, you might try asking, “And did you want the 12 ounce?” Of course, any customer who is set on ordering the 8 ounce is welcome to say so, but many times customers will agree with what you asked. In pre-service review, set up possible pairings as options - If you want to be able to suggest a certain beer or wine, you’ll need to know which beers or wines go with which entrees. Make sure all your servers are well-versed in pairings. It could even be included at the bottom of the new menu. Possibly try down selling - This may not sound like a profitable idea, but it can be! Let’s say your customer doesn’t want to order a more expensive cocktail. You might try offering a less expensive cocktail in its place, and even explaining why the less expensive cocktail might be better. This way, although you couldn’t sell the more expensive drink you initially wanted to sell, you’re still adding a few dollars to the bill. Stay focused on more profitable items - Your servers should know which items in your restaurant have a higher profit margin. For example, if a customer asks for a certain dessert, and you know you have another dessert with the same price but a higher profit margin, you might try suggesting it. If the customer doesn't know what they want is another time for you to offer a suggestion. Keeping it subtle - You don’t want your customer to know you’re up selling, so be subtle. Don’t try to up sell for every course. Be sure as a service you are still going to focus on your service - You can increase your likelihood of up selling if you provide great service. If you get orders wrong and barely meet your customers’ needs, are they going to want to order even more? Probably not. Don’t be too pushy - No customer likes to feel pressured, and if you’re too pushy, you might offend the customer and lose his or her business. Keep it simple - If a customer asks for recommendations, it’s more helpful to suggest a few things than to suggest a ton. For example, if a customer asks what beers would be good with their meal, they might be overwhelmed if you suggest every beer on your menu. Focus on a few. Be patient - Sometimes customers might have a lot of questions before they decide to check out dessert or get a more expensive entree. Be patient and answer every question they might have! Your great service will pay off. Main Auction Service recommends you offer new menu options along with all your regular meals. It's the reason many dining patrons return, they can count on that flavor they love. Adding new options in every category will help the front of the house stay on point. And, by keeping these tips in mind, you can use to up selling to increase sales and profits at your bar or restaurant. Who doesn't want to do their job well, make good tips and help keep the restaurant income ever increasing. You may even ask them if there are items they want to see on the menu. Main Auction Service is here to serve you with state of the art restaurant equipment for all your needs. New products may require different equipment in preparing these new offerings. We can help you with that. 2100 E Union Bower Road • Irving, Texas 75061 • 972-579-4612. Whether you need to buy or sell one piece, or the contents of an entire restaurant, Main Auction Services is your resource for late-model restaurant, bakery and bar equipment. Call today to speak with a restaurant equipment specialists. Selling Vegetables From Your Garden? Do You Know Your Vendoers & Clients Well? Are You Leaving Profits In The Supply Chain? Casual Dining - Is Less More In Your Location?